Heal Your Puzzle » Blog Archive » Life In Gear and On Track or Do you Feel Exhausted and Getting Nowhere? 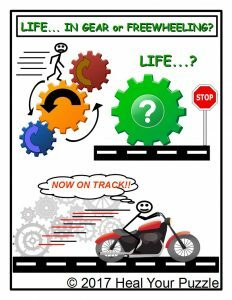 Life In Gear and On Track or Do you Feel Exhausted and Getting Nowhere? Last month I wrote about Coincidences and how the more in tune you are with your Self and your surroundings, the more coincidences happen and more of the Life-supporting and Life-Changing Events too. There will be a very Good Reason Why… Somewhere in your Being, you realise that the Life in front of you which seems so hard to get hold of, just doesn’t feel right?! This is usually a very personal feeling of something missing… there is an ‘And…’ to that road ahead, it is not complete and instead of rushing headlong into it, your Being is waiting or trying to find that ‘And..’ ! My Personal Experience of this ‘And…’ has been at times very frightening… but looking back, it has been fascinating and has made me realise that our mental health and our crises of whatever form are necessary to break through all the barriers of fear and judgement that limit us on a very deep level in who we are as Individuals…. we need to find those missing pieces in our Personal Puzzle so that we can have healthy boundaries and be able to trust each other, so that we can be Real and really care about each other and make it ok to talk about vulnerability; this is what truly makes us human and truly fulfils us. We need to be supported and relearn how to share our feelings without being scared of the consequences; our ability to function and communicate emotionally has been over time greatly distorted and buried causing, I believe, much of the terrifying events and illnesses of Today.